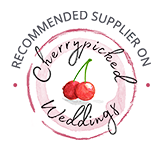 Photography is one of the key parts to your wedding – the day goes by in a flash so having a professional to capture all of your special moments is invaluable! Being able to look back over your wedding photos and relive your day is something that you will cherish forever! Making sure you pick a photographer that suits your style and ‘gets’ you as a couple is really important. You want to work with someone who understands the type of day you are aiming for and who has the ability to put you and your guests at ease – especially if being photogenic is something that doesn’t come naturally to you. What are your favourite venues in the home counties? What makes them so special in terms of imagery and photography? Each of the venues above inspire and fill me with excitement. They are a pleasure to shoot at and all provide something unique and different. I have always held fond memories of St. Albans Cathedral; I have a photo of my late Grandad and I running down the hill to the lake with the Cathedral in the background. I loved St. Albans as a little girl and growing up I can appreciate the Cathedral as art. It is an incredible building, a magnificent backdrop for engagement sessions in the park and Wedding’s under the architectural masterpiece. I have been so incredibly lucky to capture two weddings in the Lady Chapel and the ceremonies were magical. South farm is awesome! Tucked away in the countryside South Farm is a working farm and country house with the addition of Romany caravans and a Tuk Tuk. When shooting there I have found it to be extremely relaxed and fun. There are so many areas to use, including a gorgeous lake nearby and surrounding fields. Just talking about it makes me want to go back! The entrance in to Woburn abbey is beautiful; often you will see Deer roaming in the fields and great views over the countryside. As I approached The Sculpture Gallery for the first time I remember feeling butterflies. The venue is so elegant and has so much charm and I wanted to capture it all. It has the longest aisle I’ve ever shot and the most beautiful rooms, gardens, orangery and warmth. My fiancé and I hate having our photos taken. How can we prepare ourselves for the big day? Surprisingly you are not the only one, I hear this statement a lot. I have had a bride with a phobia of having her photograph taken and on the day you would never have known. To start, I like to get to know you both before the big day so I am not a stranger. Generally I would meet with you 4-6 weeks before your big day to through everything and if you have opted for an engagement session we would do this too. An Engagement session is a relaxed walk in the park, a trip to the beach or a whole lot of fun in your favourite place. The main aim for the Engagement session is for you both to enjoy yourselves helping you to relax before your big day so that when the time comes you can forget that I am ever there. It is always nice to have 1-½-2 hours for the canapés/ drinks section in the day. We won’t be shooting the entire time, as I like to allow you to have breaks to speak to guests, enjoy canapés and take in the day. I try to limit the family combinations to around 10 so you aren’t left with Wallace and Grommet smiles- this should take around 45 minutes. For your couple session I would say another 45 minutes however I reserve 20 minutes of this for golden hour at sunset- the best light to shoot in! Is it true that I need to wear more makeup than usual to look my best in the photographs? Yes, you may feel you have a lot more make up on than usual but more can still create that natural look, it will just make your eyes and colour pop In your photographs. What’s the best way for me to stand so that I look my best? If you decide to do an engagement session we would practice some different poses then. If you are meeting me for the first time on your big day then I will help to create the most flattering angles for you both. The majority of the time in your couple shoot I will put you both in a position but you will move naturally to what is comfortable for you. We can discuss before the day if you have preferred side or if there is something you want me to hide / enhance about you. Is it more common to have formal photos or reportage? I would say there are a lot more couples requesting reportage but then having regrets that there wasn’t a photo taken with someone close to them. My work is a mix of both styles. I like to document you throughout the day as things unfold, I don’t like to interfere too much until the ‘formal’ photographs where I will help get the people you love into position so that you are not all standing waiting for too long. My role at your wedding is to be a fly on the wall capturing the day, the happiness, the tears and all of the emotions. Would you recommend having black and white photos? I predominately prefer colour however If my couples specifically like black and white images I usually pick photographs that are full of emotion. Removing the colour draws your eye to the raw emotion and tugs on your heart strings. 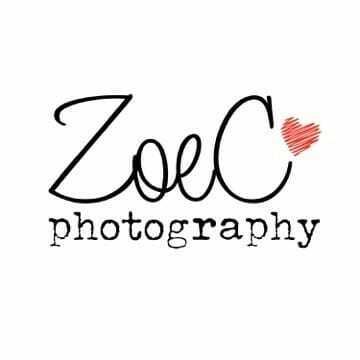 If you would like to contact Zoe for more information please visit her website (and check out her testimonials and gallery!) 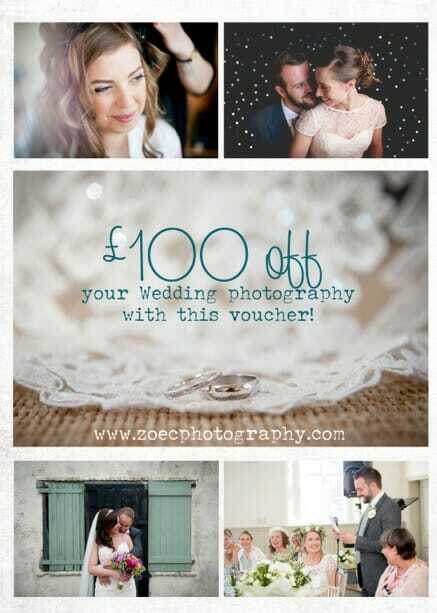 Zoe is also offering a £100 off voucher for each reader! Don’t miss out on this fantastic offer!.